I’m pretty sure they say horizontal stripes are a no go for anyone who is trying to appear thinner. I’m not sure who they are, but TRAAAA – not interested. 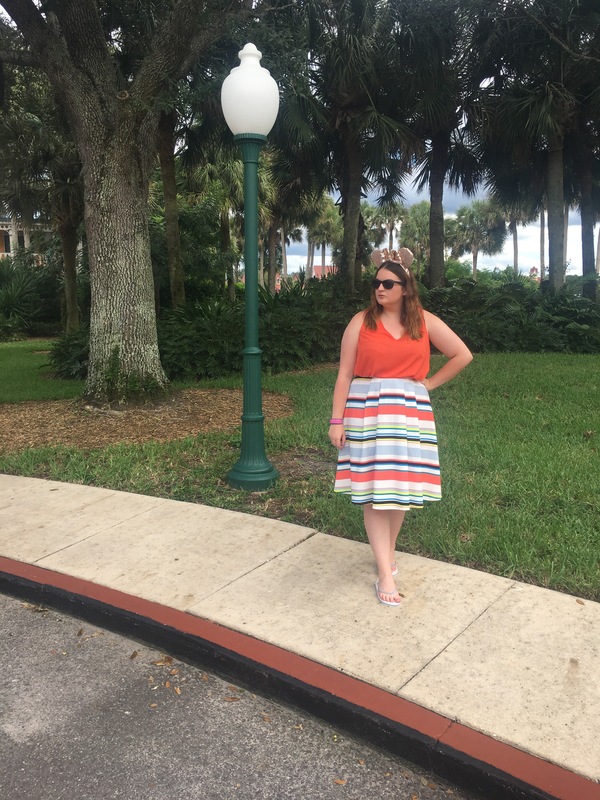 I am currently in Florida on a much deserved holiday, but I’ve wanted to share this outfit since I bought the skirt from New Look in August. It was a purchase solely for my holiday but I love it that much I’ve worn it to the office a couple of times (obviously not with these Primark flip flops). Paired with a top from the Primark sale I bloody love it. I think it pulls in the orange from the skirt perfectly, creating one of my favourite outfits. To address the shoe situation, I’m having a nightmare with blisters (so glamorous) and the shoes I’d usually wear with this are implements of torture so they are a no go… life. As much as I love the skirt, these ears are just something else. Rose gold. Disney. Ears. They are from Ears Ever After on Etsy and are such good quality. I’m so glad I decided to buy a second set of ears for my trip, I’ve barely taken these off! Whoever said that seriously doesn’t know a thing about fashion. As always you look amazing! I hope Florida is treating you well.